The DW Performance Series 8'' x 7'' Tom, White Marine is an add-on tom for DW Performance Series drum kits. 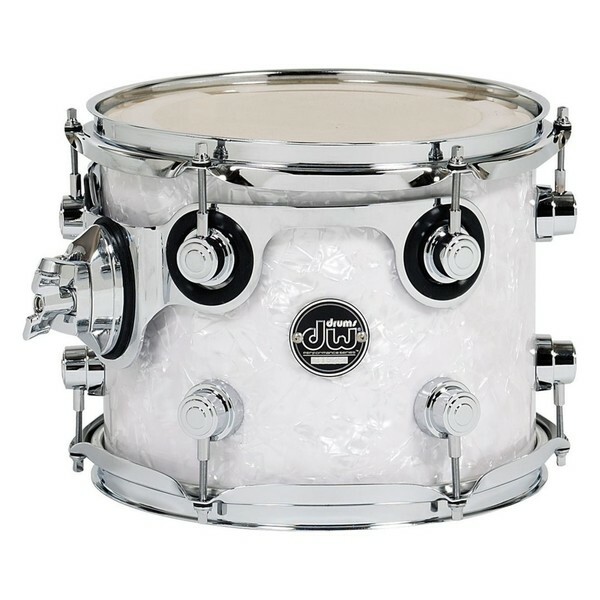 The tom features a maple HVX construction and is fitted with durable chrome hardware and finished in white marine. With it's 8'' x 7'' configuration, the tom is the perfect addition to any DW Performance kit, especially if you only have a single tom. These responsive drums capture all the subtle nuances of any playing style and allow individual drummers to shine. Plus, with unique quarter turret lugs and an ultra-durable finish, these drums look as good as they sound. DW Drums began in 1972 when Don Lombardi (now the President of DW Drums) opened a small teaching studio Santa Monica, California. The studio was named Drum Workshop and offered both private lessons and monthly workshops. John Good (now DW's Vice President) signed up for lessons at age 17 after seeing an ad for the workshop, in the hope of improving his drumming and removing his bad drumming habits. Don began to realise that he was losing profits from the business and resorted to selling sticks, books and drums to help clear the expenses. After three months of lessons, John was told by Don that he would not be successful, and instead was hired by Don as a part-time sales manager. The pair would chat for hours, brainstorming ideas and ways to improve drumming as a whole. And from this, the first DW product was born: a height-adjustable trap case seat. At first, the duo was selling about a dozen seats per month, at which point Jon quit his job to work full-time for Don. Soon after, a large order was placed for a hundred of their products, at which point the pair realised that they had created an innovative product that would sell. Since 1972, DW Drums has progressed to become a worldwide giant in the drumming industry, owning a number of iconic brands including Gretsch, LP Percussion, and more. A range of revolutionary products have been released and changed the way people drum all around the world.